Given that my wife is in the later stages of pregnancy I've been cooking more often than usual, and I'm pretty proud of a recent sauteed spinach recipe I've concocted (she needs more iron!) among other main courses. 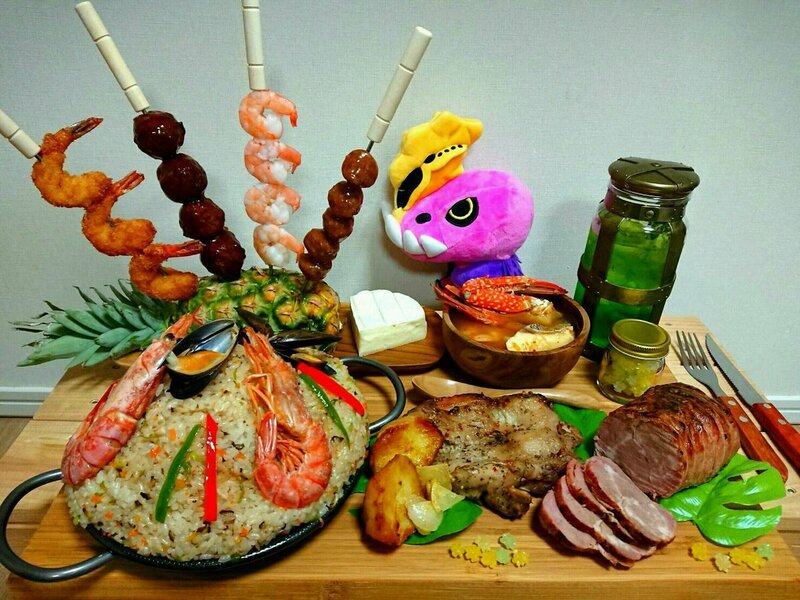 But this series of Monster Hunter dishes from Twitter user Ki-Ki's wife deserves a legitimate chef kissy fingers emote in real life. I just did it. Modeled after an in-game dish (you can see the comparison in the gallery below), they go above and beyond and even add in various odds and ends to spice up the presentation a bit. That konpeitō? It's thematic scout flies. If you're curious the meal has a lot of info attached to its Twitter post, including its cost (roughly $36) and prep time (three hours). That's not bad at all since this could feed a family of four handily. I just spent an hour and a half the other day making al dente pasta and homeade sauce for two people!